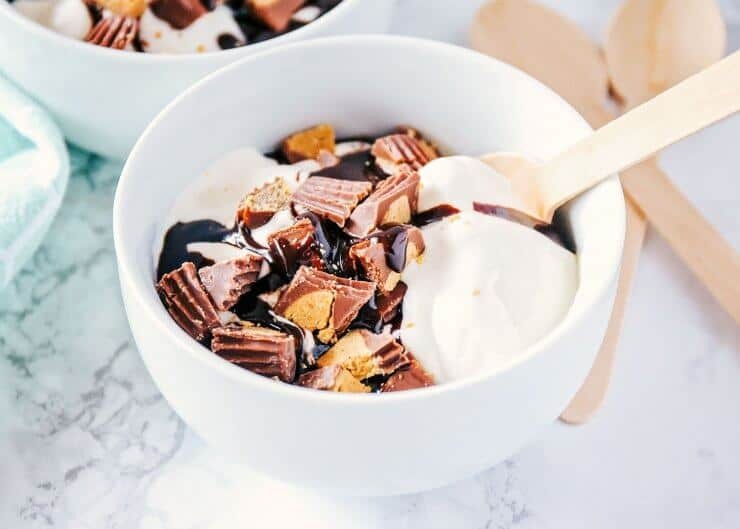 Homemade Vanilla Ice Cream with Reese’s – A simple and delicious homemade ice cream recipe that’s made with NO eggs! Perfect for adding your favorite toppings. This homemade vanilla ice cream recipe will quickly become a family favorite! Homemade ice cream is one of my family’s most requested desserts. 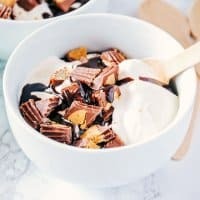 This Reese’s ice cream is at the top of our list, along with my easy chocolate ice cream, no churn ice cream with berries and strawberry pop-tart ice cream. One of my favorite desserts to make is homemade ice cream. 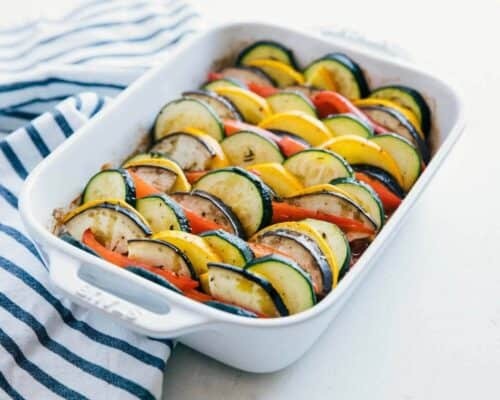 I especially love to make it for my family during the Summer, but let’s be honest – we love to eat it all year long. :) This homemade vanilla ice cream is super easy to make and contains NO eggs! I combined it with Reese’s peanut butter cups (my favorite candy), but this ice cream tastes absolutely delicious without the Reese’s as well. Feel free to mix in any of your favorite toppings to make the ultimate treat! What are the ingredients you need to make homemade ice cream? 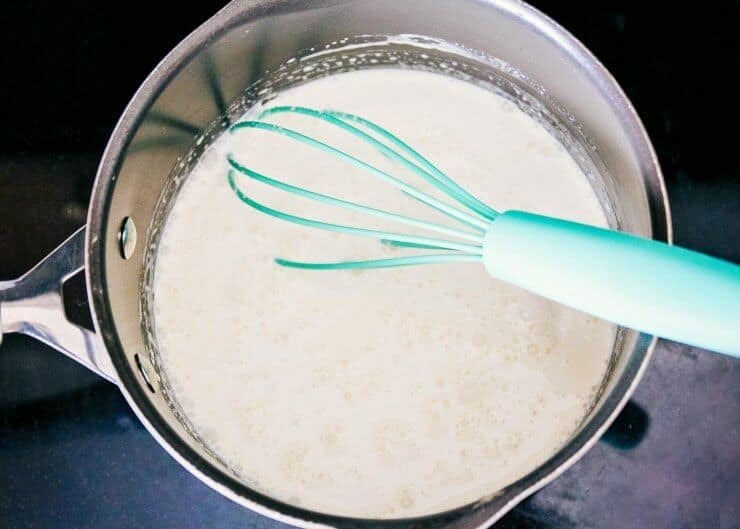 This homemade vanilla ice cream recipe is made with just 5 simple ingredients! The best thing about the homemade ice cream is that it doesn’t contain any eggs. 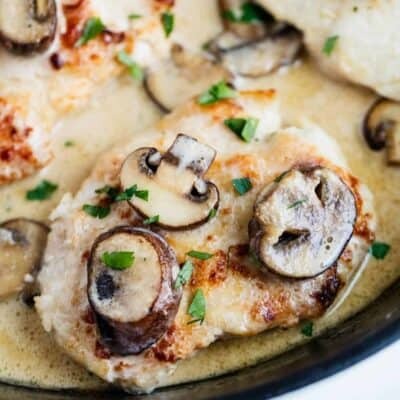 So easy and absolutely delicious! 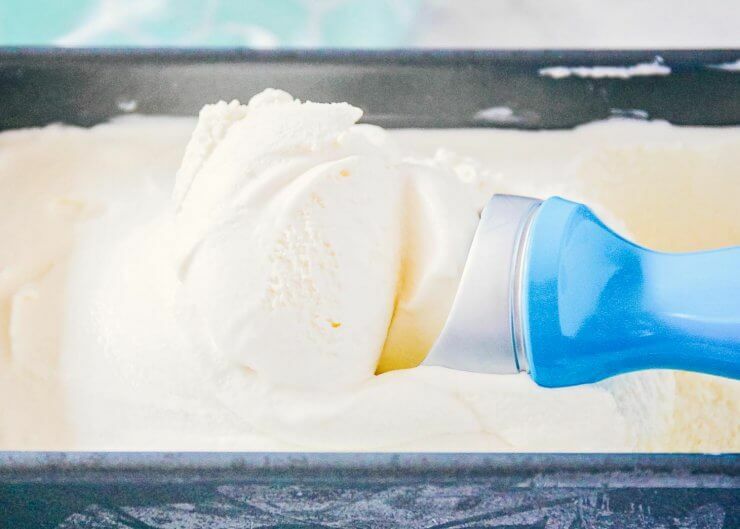 This homemade ice cream recipe is super easy and will definitely become a staple. Just follow the simple steps below. Scroll down for the printable easy homemade ice cream recipe. Combine all ingredients (except Reese’s or topping of choice) in a medium sized pan over medium heat. Bring to a slight boil, stirring constantly and then remove from heat. Stir until the sugar crystals are dissolved. Place in the refrigerator to allow to cool completely. Place cream in your ice cream maker and begin to churn the ice cream. 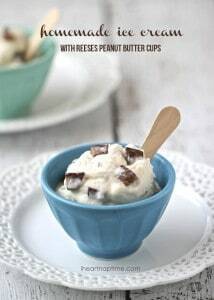 As soon as the ice cream looks like frozen yogurt (about 20 minutes in), add the chopped Reese’s (or you can leave plain and add toppings once scooped). Continue mixing until you reach a desired consistency. Store ice cream in an air tight container in the freezer to become firm. Enjoy while cold! What I love about this homemade vanilla ice cream is that it’s so customizable. The topping options are endless! 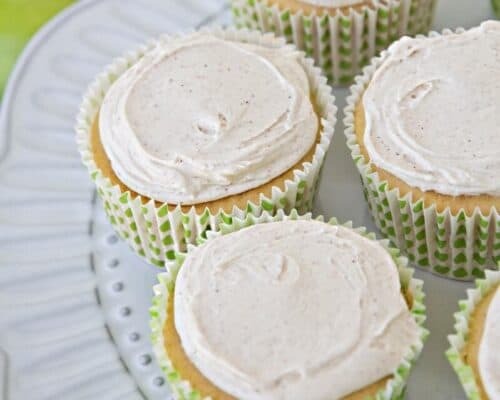 Below are a few of my favorites, but you can add any topping that sounds good to you! Serve with a baked dessert: There’s nothing better than a scoop of ice cream with a warm, baked dessert. 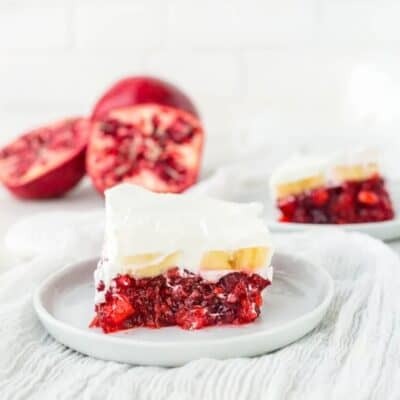 Some of my favorite desserts to pair with homemade vanilla ice cream are peach cobber, chocolate fudge caramel brownies or a delicious chocolate chip cookie. Banana split: We like to use this homemade ice cream to make a classic banana split. It’s so fun to set up an ice cream sundae bar with all of your family’s favorite toppings. Milkshake: Use homemade ice cream to make a delicious milkshake and enjoy! Root beer float: You can’t go wrong with a classic root beer float. If you’re looking for fun variations, try making a Coke float or blueberry lime soda float. Ice cream cake: Ice cream cakes are perfect for a birthday party or get-together! Check out my favorite “Take 5” ice cream cake recipe. Homemade Vanilla Ice Cream with Reese's - A simple and delicious homemade ice cream recipe that's made with NO eggs! Perfect for adding your favorite toppings. This homemade vanilla ice cream recipe will quickly become a family favorite! Combine all ingredients (except Reese's or topping of choice) in a medium sized pan over medium heat. Bring to a slight boil, stirring constantly and then remove from heat. Stir until the sugar crystals are dissolved. Place in the refrigerator to allow to cool completely. 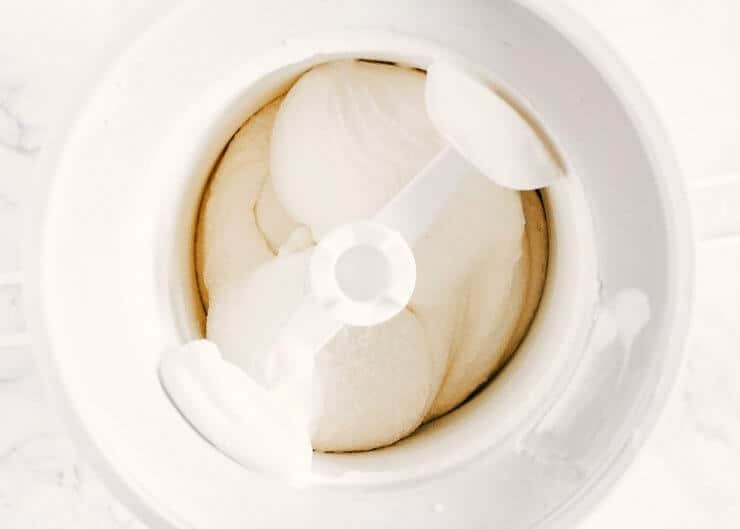 Place cream in your ice cream maker and begin to churn the ice cream. 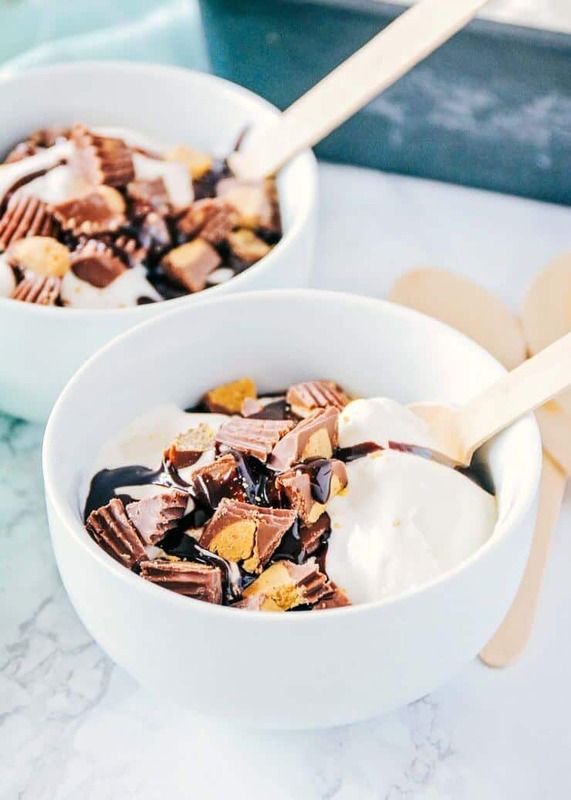 As soon as the ice cream looks like frozen yogurt (about 20 minutes in), add the chopped Reese’s peanut butter cups (or you can leave plain and add toppings once scooped). This look amazing….Got something new here…. This is such a fantastic summer treat!! 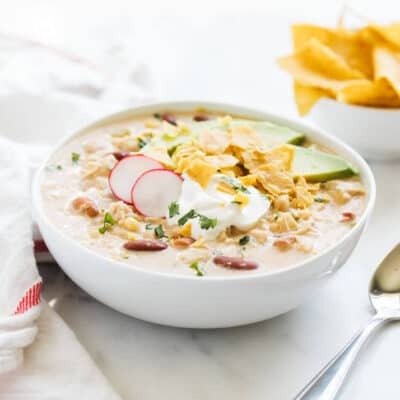 I want a bowl right now!! I never say NO to a good ice-cream!